Molecular formula: C22H23O3N. Molecular weight: 349. 43. Commodity name: Fenpropathrin, mecthrin, danitol. Chemical name: A-cyano-3-phenoxybenzyl-2, 2, 3, 3, -tetramethyl-clopropanecarboxylate Physical and chemical quality: The original pesticide is a yellow-brown liquid. Water cannot dissolve it nearly, but the organic solvents such as benzene dimethyl and Cycehexane etc. Under the alkaline condition it resolves. Toxicity: The toxicity of Fenpropathrin is medium to human and animals. Products specification: 20EC, 10EC, Tech 92% min, and Powder 95% min. Object of prevention and cure: Fenpropathrin has good eliminating and prevention effect for many injurious insect and mite such as Lepidoptera, red mite, cotton aphid, pink bollworm, fruit moth, tea caterpillar, tea looper, wood louse, spider, pear core insect, cabbage caterpillar and cabbage moth etc. 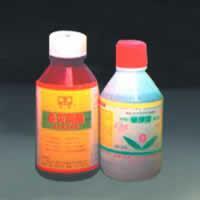 Our company is specialized exporter, manufacturer and supplier of Pesticide Fenpropathrin in China.